Boom! 34 weeks and half way though the 2 weeks of Rowan being gone! As I am not really going to the store I am having to steal these photos. Not exactly what I wanted to have happen, but you know, life is like that sometimes...well I guess a lot of the time. Size: 5.8 lbs, 18.7 inches. 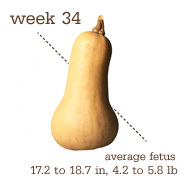 The size of a butternut squash. Cool life events: Could breath real air without assistance; [if Rowan was home] they would not stop labor. Contractions are the same if not a little more consistent. I am not going into a labor...and trying to mentally prepare myself for this kid to come 2 weeks late. I mean seriously that could happen. 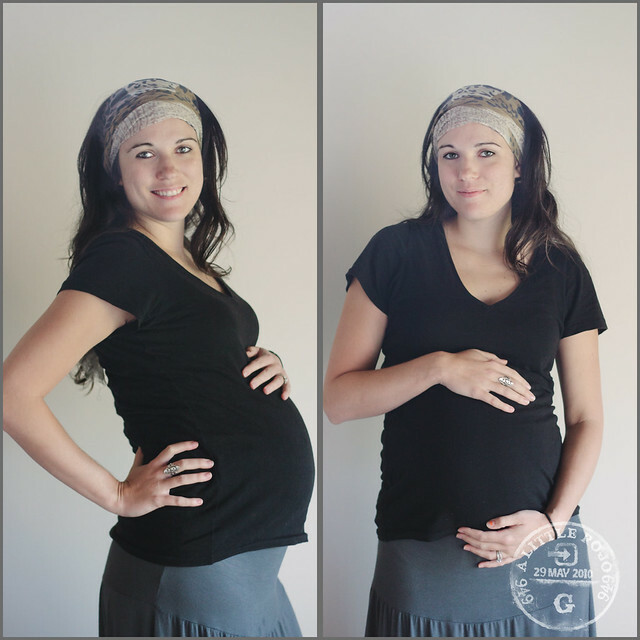 Just because I am having these contractions does not mean I will not make it to my due date. I am not letting myself think he is coming early. This will only bring me to discontentment and wishing time would move faster. I am getting more and more eager to hold the little guy. And more and more ready for him to not be up in my rib cage. I think my son will love freedom. My back has been bothering me a little because I am not able to stretch or walk. I am looking forward to getting back to that once Rowan gets home. But for the most part I feel great and content and excited.